Stress and fatigue are both conditions that affect everyday life. They are separate disorders that can stand alone, but can also occur together, both acting as causes and symptoms of the other. 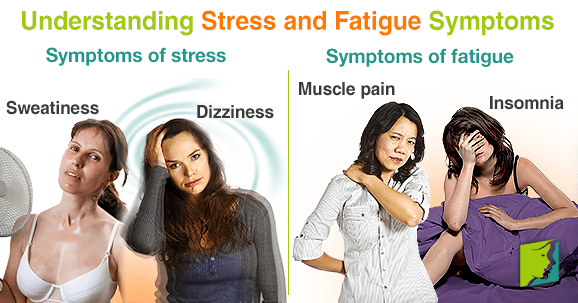 Some of the symptoms of stress and fatigue are similar, as are many of their causes. Read on to understand more about common stress and fatigue symptoms. Stress is a normal and healthy emotion in small amounts. It keeps the mind focused and motivated to achieve. However, stress levels must be kept within a healthy parameter. Once stress levels exceed this, it can cause all sorts of unpleasant symptoms and even affect health. Too much stress has been known to cause high blood pressure and cause depression. It can also weaken the immune system and leave the sufferer vulnerable to various illnesses. There are many factors that can contribute to stress, such as bereavement, work or family problems, and genetics. Stress can have adverse effects on internal psychological processes, physiological health, and even behavior. Much of this has been linked to the hormone cortisol, which is released in times of stress. Stress itself and also its symptoms can lead to bad coping behaviors, which can further exacerbate current symptoms or even create new ones. A list of some of the most common symptoms is below. Too much stress can lead to synapses firing the wrong amounts of neurotransmitters like serotonin in the brain. As serotonin is responsible for mood, this is what leads to a depressive feelings and angry outbursts. In order to deal with these emotional states, many people use smoking, drinking, or some other unhealthy vice as a means of escape, and these end up intensifying the stress. This is an incessant state of overtiredness, and sometimes does not disappear even after sleep or rest. The causes of fatigue are innumerable and, much of the time, they work together. Causes include lack of sleep, medical conditions, stress, and hormonal imbalances. Fatigue can develop in anybody, but is far more common in women than men. Fatigue is debilitating and can affect everyday life; in some of the severest cases, a person might not even be able to get out of bed. The reasons for many of these physical symptoms, such as muscle pain, is not entirely clear. There seems to be no physical abnormality linked to chronic fatigue syndrome, so doctors rely on a set of symptoms for diagnosis. Furthermore, no genetic component has been found, but the disorder does seem to run in families. Stress and fatigue come with a range of unpleasant symptoms, which can negatively impact day-to-day life. Therefore, it is important to seek medical advice as soon as you feel you are beginning to develop either condition. They are both curable, and there are a range of treatments available. Adrenal fatigue during menopause can be an exhausting symptom. Read on to learn more.